Below I'll list the tools and supplies you need to make a concrete countertop. It's important to have the right tools to make your job easier. There's a lot of different techniques the pros use but I'll just keep it simple and list the basic stuff. If this is your first time making a concrete countertop I would definitely consider having the tools below before you start. Affiliate disclaimer: The links to the tools and supplies below are affiliate links. When you click on a link it will take you to Amazon.com. If you purchase something, I will receive a small commission. This is how I keep all the information on this site free. If you purchase a tool or some supplies to make your concrete countertop then THANK YOU. I really appreciate it! This rubber edge from will give you a finished edge on your countertop that looks like stone. The manufacturer has many different textures to choose from. The form is 2 inches high and 8 feet long. You can cut it to length. This is one of the drills we use to screw the forms together. We also use the impact driver but this one will do everything you need. Make sure you pre-drill the holes before you screw, this eliminates cracking the forms. Put a little Vaseline over the screw head to keep any spilled concrete from sticking to it. These are the sink knockouts you use to make holes in your countertop for the faucet and hot & cold water handles. We use black caulking and a smoothing tool to caulk the corners and edges of the forms after they are screwed together. This provides a nice smooth edge when you strip the forms. FORMS - We use melamine 4x8 sheets for forms and cut them to size. Melamine has a very smooth surface which makes polishing that surface much easier. You can get this at your local lumber company. You could also use smooth finished plywood although you may see some of the wood grain in the surface of the concrete after you strip the form. This is the kind of mixer we use. You can use a 1/2 inch drill or just mix the concrete in a wheelbarrow. This mixer is just a lot faster and makes mixing the concrete very easy. This is the mixing tub we use. You can easily mix an 80lb bag of Quikrete in this tub with the drill mixer. When you're done, just rinse it out and use it over and over again. This bag from Cheng contains a color pigment, superplasticizer, and fibers. You just add it to a 80lb bag of Quikrete or Sakrete. You can make your own countertop mix from scratch. Here's my list of ingredients you will need. This polishing kit includes the polisher and all the polishing discs you need plus a DVD from Cheng that shows you how to use it. This is what you use to fill any voids and pin-holes after you polish up to a 400 grit. Just mix the slurry and rub it into the voids using rubber gloves. Scrape off the excess with a plastic puddy knife then let it dry overnight and continue polishing. 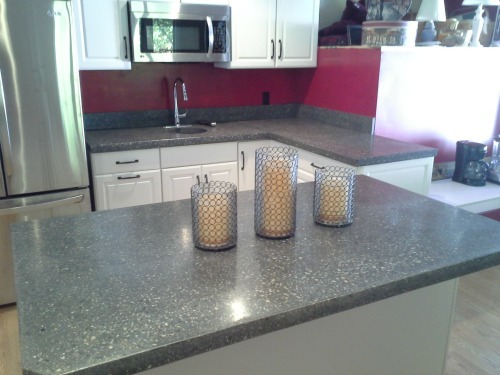 For some more information and a video about polishing, check out my page about finishing concrete countertops. This is a water-based penetrating sealer. All you need is a small mixing container so you can dilute the first coat with water and a microfiber cloth to apply the sealer. This will cover 30 - 40 sq. ft. and you will apply at least 3 coats. You can also order the gallon container if you want. This includes a cleaner, polish, wax and buffing pad to keep your countertop looking great. Here's a video showing you how to apply the sealer.